The Matrix Switch Corporation MSC-5-1616 16 x 16 VGA RGBHV Video Routing Switcher offers a wide signal bandwidth and low crosstalk technology, allowing for artifact-free images at almost any image resolution including QXGA. For applications that require a very large number of inputs or outputs, this router can be cascaded up to 256 VGA inputs by 16 VGA outputs, with no degradation of overall performance. 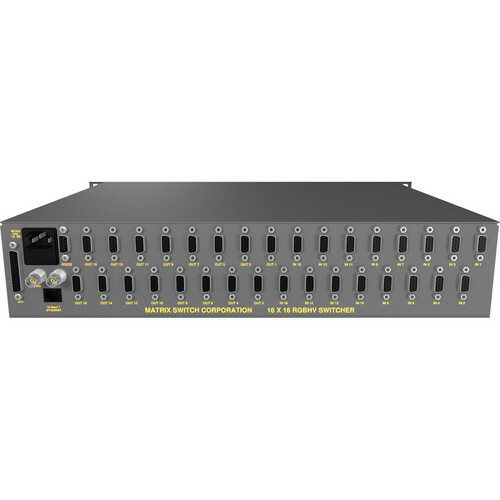 It can also be combined with Matrix Switcher’s Analog Audio or AES digital audio routers, by connecting them with a D25 straight through cable. This 16 x 16 switcher consists of audio and control panel options. It has no audio (video only), AES3 S/PDIF 75Ω digital audio on BNC I/O, AES3 Balanced 110Ω digital audio, and unbalanced or balanced stereo analog audio. Box Dimensions (LxWxH) 24.0 x 18.0 x 8.0"